Westinghouse Electric Company completed the turbine control upgrade at Qinshan Phase II unit 2 on 4 September 2017. It is the first of four such upgrades the company is implementing on indigenous design CNP-600 pressurised water reactors at Qinshan Phase II, and the first such upgrade Westinghouse has completed in China. The upgrade at Qinshan Phase II unit 2 replaced the plant’s original Westinghouse Distributed Process Family based turbine control system with a robust OvationTM based turbine control and protection system. The project also included mechanical scope, which consisted of Westinghouse replacing the mechanical overspeed bolt turbine trip system with an electro-hydraulic system and added redundant linear variable differential transformers for valve position indication on the main governor valves. The former turbine control and protection system was once the state of the art both electronically and mechanically – but that was more than 30 years ago. It had become obsolete both electrically and mechanically. having a control system common to both fossil and nuclear power plants in the fleet, which facilitates support of the system by utility personnel at multiple utility sites. In addition, Westinghouse works to contain total installed cost by using a low-risk field implementation strategy, making maximum use of closed loop models and performing extensive validation and testing before the system ships to site. Westinghouse has designed and installed more than 20 turbine control and protection systems in the United States, South America and Europe. With the first contract for this system in China, one of the company’s top priorities was to help build local turbine control and protection system experience. Initiation of this occurred when Westinghouse engineers based in the USA travelled to China to meet with those based in the Westinghouse Shanghai office for a project kick-off meeting to begin the detailed planning. Hands-on training began in 2016, when several groups of the China-based engineers travelled to the US headquarters. As well as training on the Ovation system, there were sessions on how to design a turbine control and protection system using the platform and how to conduct and document reliability studies. These initial sessions also covered the writing of procedures, design specifications, test reports and other engineering documentation following Westinghouse processes. Design detail is important to maintaining consistency across teams in delivering these projects to customers. After the design and software was completed, the China-based engineers were provided with training on software-in-loop testing and then presented and demonstrated all turbine software functions to the Qinshan customer in the US. Such comprehensive hands-on training continued throughout the project in China during verification and validation, factory acceptance testing, site installation, site acceptance testing and commissioning, and finally power ascension testing at the plant site. 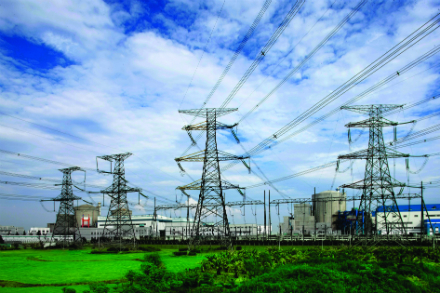 China National Nuclear Corporation selected the Westinghouse turbine control and protection system to reap the many benefits that the system and the entire design and implementation process have to offer. Westinghouse’s electronic scope for the project included removing and replacing four control system cabinets and one network infrastructure cabinet, including turbine control, turbine protection, automatic turbine control and rotor stress and moisture separator reheater cabinets, as well as their associated computer system and manual controls in the main control room. The new cabinets were custom built to fit in exactly the same locations as the original cabinets, including using identical bolt patterns to mount the cabinets to the floor. This level of attention to detail reduces the time and cost of installing equipment in the plant. Westinghouse also provided pressure transmitters that were direct replacements of older pressure switches used in the turbine protection system. Providing the pressure transmitters and using them as inputs to special software algorithms in Ovation achieves increased reliability and provides better information to both operators and maintenance personnel. The more modern computer system and control panels in the main control room provide the turbine control operator with updated screens and functionality for alarms, trending and troubleshooting. They also allow valve tests and protection system tests to be more easily performed by the operator. The modern computer system is also more intuitive, easier to operate and maintain and allows a new generation of operators to quickly learn the system. As already mentioned, Westinghouse’s mechanical scope was to remove the mechanical overspeed bolt protection system and replace it with an electro-hydraulic overspeed protection system. The new electro-hydraulic system utilises a 2 out of 3 solenoid valve scheme to allow online testing of the protection system while the turbine-generator is producing power. The new system is more reliable than the older mechanical system and allows overspeed tests to be performed at reduced speeds, which eliminates stresses to the turbine. Additionally, the new system has multiple redundancies to protect the turbine and plant personnel from dangerous turbine overspeed conditions. The protection and the system responsible for it are extremely important for proper steam turbine operation. Some of the new equipment has been provided by Westinghouse’s alliance partner, Emerson Process Management. Westinghouse and Emerson have frequently collaborated on nuclear projects since Emerson’s acquisition of Westinghouse’s Process Control Divsision in 1998. When a large turbine is operating, a large amount of thermal and mechanical energy courses through it. If its rotational speed exceeds the unit’s safe operating limits, the turbine blades can be pulled apart by centrifugal force resulting in catastrophic consequences such as damage to the entire turbine and rotor shaft and bearings, damage to the generator, damage to the condenser and damage to the turbine building. In worst case scenarios, the disintegrating parts can release hot, fast-moving shards of metal that can cause serious injury or fatalities. Turbine overspeed conditions can be caused by a number of anomalies. While the mechanical bolt overspeed protection system is effective in preventing such overspeed conditions, it takes much more time and effort to calibrate and test it, which must be done once per year, and it is vulnerable to single point failures. The mechanical overspeed bolt protection system consists of a mechanical device – essentially a bolt (or ‘plunger’) attached to a spring – located in the turbine shaft (see photograph, above). When the turbine spins at normal speeds, the bolt tip is held almost flush to the shaft by a spring that has been adjusted to compensate for the centrifugal force generated at that speed. If the turbine rotates in an overspeed condition, the increased centrifugal force extends the bolt outward until it hits a mechanical lever that results in releasing the hydraulic fluid pressure that operates the turbine steam valves. The turbine steam valves close and cut off the flow of steam to the turbine blades, causing the turbine to slow down. For this to work properly, the spring tension on the bolt must be calibrated exactly and checked annually. Doing so requires removing the turbine housing and making manual adjustments to the spring. Prior to restart of the turbine and other outage exit activities, the system must be tested. Testing requires going to controlled – but actual – turbine overspeed conditions, which is a process that stresses the turbine and is dangerous in itself. If the test results show that the spring is not properly calibrated, the turbine must be torn down again to access the spring for recalibration. The entire overspeed testing process must then be repeated until the calibration is correct. The electro-hydraulic overspeed protection system renders such manual adjustments unnecessary, does not have any single point vulnerabilities and is more reliable. Electronic setpoints replace the spring-bolt combination and can be adjusted easily from the control console to conduct testing, which can be done at less than full overspeed. This test process greatly reduces the time needed for this activity from hours or days to minutes. The plant can get to start-up much quicker, and the stress that the testing process places on the turbine is greatly reduced. The new system also offers multiple paths to eliminate single point vulnerabilities. Qinshan Phase II unit 2 now has diverse overspeed protection, with two different methods of tripping the turbine for overspeed or other conditions that could cause damage to the turbine. These methods are also controlled by two different systems. The Ovation-based control system monitors three passive speed probes that use magnetism to measure rotation speed. In addition a Woodward-based control system monitors three active probes that produce pulses to count rotations. Each system has the ability, independently of the other, to shut the turbine down if the turbine shaft is spinning too rapidly. As part of every project of this kind, including that at Qinshan Phase II unit 2, Westinghouse conducts reliability analyses of the old and new overspeed trip systems. The mean time between failures of the old mechanical bolt system is compared to that projected for the new system based on the reliability analyses. For the new system, Westinghouse provides all of the calculations for Ovation and the electro-hydraulic trip system and these show that the reliability of the new electro-hydraulic equipment is improved significantly over the old. In addition to the benefit of a more reliable turbine trip system, insurers and underwriters consider this kind of data, which is needed to prove that the new system the plant is investing in is more reliable than that being removed. Plants are also provided with a recommendation on testing frequency using the new Ovation control system, which is very easy to test and monitor. Its built-in diagnostics reduce operator concerns of potentially causing damage or overstressing the turbine. The design process included developing a plant-specific dynamic model of the Qinshan Phase II unit 2 steam turbine. This plant-specific model was used to develop control system logic, alarms and operator interface graphics that specifically meet the plant’s needs for integrating and operating the new system within the new instrumentation and control system. Westinghouse also applied the plant-specific dynamic model to facilitate other activities throughout the process, including testing. For example, once the plant-customised turbine control and protection system software was designed, it was interfaced in a test bed environment with the plant-specific dynamic model as part of the software-in-loop testing to verify and validate the new system before it was manufactured. Certain physical plant-specific needs in addition to the bolt pattern for the logic control cabinets informed the design as well. For example, like other plants replacing significant systems, plant personnel wanted to reuse cables from the former system. The cabling arrangement at Qinshan Phase II unit 2, however, posed a new challenge to designing the logic control cabinets because the existing cables were all top-entry to the original cabinets and landed on terminals that were located high inside the cabinets. This required system designers to carry out very detailed planning at the design stage to ensure the Ovation input/output modules were located high enough in the cabinets to connect with the existing cables. The cables were then re-terminated in the same general location as before, avoiding the need to install new cables. The old control system did not have redundancy for the turbine steam governor valves and this constituted a single point of vulnerability. The new Ovation system provides redundant valve position modules for servo valve control, and mechanical modifications were made to install redundant linear variable differential transformers for position feedback. This allows a complete failure of a governor valve servo coil or linear variable differential transformer without the system losing the ability to control and maintain proper turbine operation. Diagnostics and alarms indicate problems to the operator while still allowing the power plant to generate electricity. Westinghouse conducted the factory acceptance testing in China. This provided an opportunity for the Westinghouse engineers based in Shanghai to have further hands-on training. This enabled them to work with the equipment and the actual control system, as well as interact with the customers, helping to address language barriers. The US-based engineering lead, who remained onsite during the factory acceptance testing and system installation, worked with a China-based supplier to provide a hydraulic test stand to be used for factory acceptance testing of the valve position modules. This hydraulic test stand was also used to teach the China- based engineers more about valve control redundancy, how Westinghouse-designed redundancy works and how to test it, as well as how to perform a valve calibration. When it came to site installation, those same engineers went with the US-based expert to learn how to install and test the equipment within the plant operating environment. The more recently qualified engineers gained significant knowledge and experience, which will help greatly in future design and installation projects in China. Westinghouse will be completing turbine control and protection system upgrades at Qinshan Phase II units 1, 3 and 4 in 2018. Westinghouse is also expanding training in China on its instrumentation and control systems and has recently begun planning for that training, as well as hiring instructors at the company’s offices in Shanghai, Pudong District.